Which Came First—the Egg or the Egg Dish? 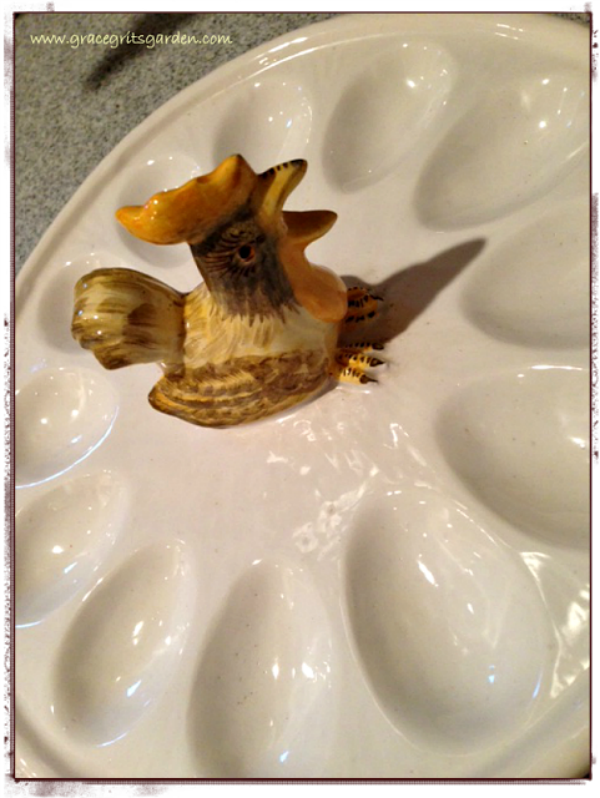 Which came first, the deviled egg or the egg dish? Since necessity is the mother of invention, I suppose the deviled egg. But the dish must have quickly followed. How else how did folks tote around deviled eggs to church picnics and holiday spreads? I am obsessed with egg dishes. Never can I pass one up at an estate sale. Each is different, unique in its own way. Most of mine are handed down from family members, but I have a few newish ones like my fun Fiesta dish (thanks Marcia!) and my white plastic Crate & Barrel dish which is more practical poolside and at Munger Place porch parties. Egg dishes make me as happy as the deviled eggs themselves. This one was my mother-in-law’s. 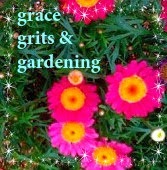 I bought this one at Wildwood Antiques in Etowah, Arkansas. I love the gold rim around this antique one. a) Are deviled eggs part of your Thanksgiving meal? b) Do you have a deviled egg platter? New or vintage? More than one? c) Do you have a special deviled egg recipe? My recipe? 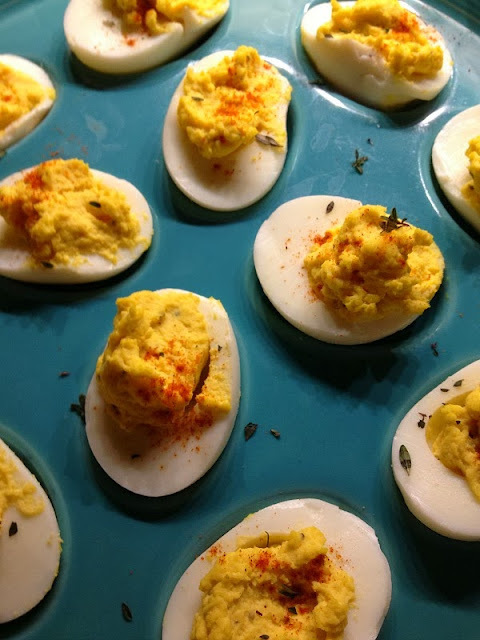 I’m a purist when it comes to deviled eggs. I never stray from the basic ingredients of Hellman’s mayonnaise (must be real mayo), yellow French’s mustard, egg yolks and sea salt. I top with paprika and sometimes fresh thyme. That’s it. We usually have deviled eggs for Easter dinner and other times during the year but not for Thanksgiving or Christmas. My recipe is the same as yours except I add a teaspoon of vinegar. I have an egg plate very similar to your mother in law’s. Happy Thanksgiving. 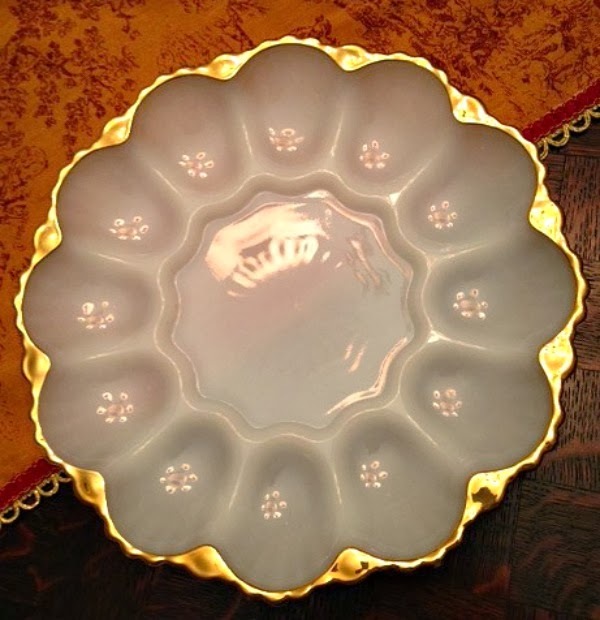 Although I resist temptation and don’t purchase, I am always attracted to those dishes in flea markets. My mother, who is an artist, had one that looked like an artist’s palette. Hmm…wonder if she’s still got it? I, too, am a purist – your recipe sounds perfect! We had deviled eggs yesterday and they were superb. Someone brought them, which is my favorite kind! My recipe sounds like yours. 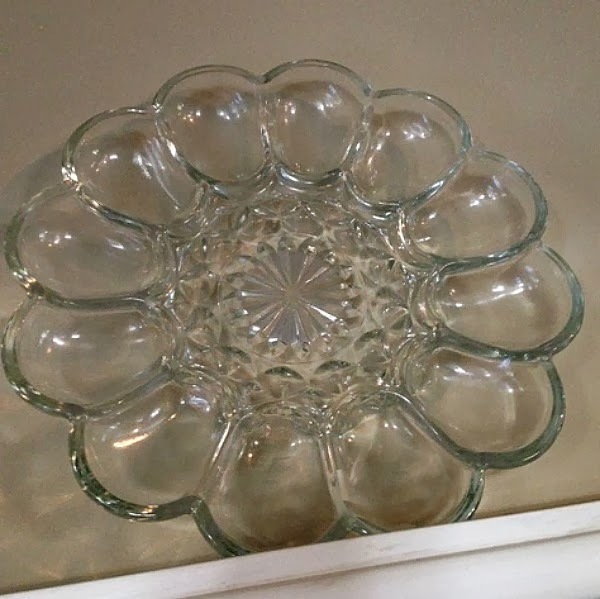 I have my mother’s dish which is similar to yours. Hope your day was good. Ours was. don’t mess with the classic recipe! and sadly no one made deviled eggs for any of the eating I was involved in! Good one! Same as yours, except sometimes a bit more kick with some cayenne, and sometimes a slice of olive in the center of each egg. Just to give it that extra bit of salty goodness. Oh, and sweet pickle relish. Gotta have some of that. I don’t have an egg dish.